Brevet Brigadier-General Oscar Veniah Dayton is one of those characters that seem to be more fitting within the pages of the Policeman’s Gazette than in a historical account. William Dayton , Oscar’s grandfather and a Peer of England, immigrated to the United States and settled in Westchester, New York and married Mary Brown. Oscar’s father, John Harvey Dayton also an English peer, was born in England in 1770, and immigrated to the United States after the War of !812, married Charlotte E. Tomkins on January 19, 1819 in Catskill, Greene County, New York. Like many of their generation, John and Charlotte produced a large family; John Harvey (1819-1820), Daniel (1821-1823), James Lewis (1824-1891), Mary Elizabeth (1825-1826), Oscar Veniah (1827-1898), George Washington (1829-1829), John Harvey (1830-1849), Julia Ann (1832-1835) and George Washington (1839-1909), but only three lived to adulthood. The 1860 Federal Census lists the family’s occupation as that of a farmer. According to the Gibbney family records discovered in Ancestry.com and confirmed by the New York Genealogical and Biographical Record of 1932, Oscar enlisted in a New York regiment to fight in the Mexican American War ( also called The War of the Republics), but the regiment was never called into service. Apparently frustrated and impatient at the delay, Oscar travelled to the battlefield alone. No other records could be found to reveal any military or civil involvement while he was there. After the Mexican War, Oscar travelled to San Francisco, California where he worked as a theater manager alongside his brother George, who had a strong reputation in the city as a scene painter. After returning to New York, Oscar Dayton moved to Osawatomie, Kansas, where, according to family history he commanded a Free State company and ran an abolitionist newspaper called The Kansas Times. Osawatomie was settled by members of the Emigrant Aid Society in the 1850’s and was heavily involved in the free state movement. Two battles were fought between free and slave factions in the area during 1856. However, no records could be found in the Kansas Archives of either his military and/or journalistic efforts. To be fair, during the Bleeding Kansas era, military companies were formed and dissolved frequently, and newspapers sometimes only lasted for a brief period. After returning to New York, Oscar Veniah Dayton married Agnes Ada Shea on September 22, 1854, in New York, New York ( marriage I.D. # 2220307479). Agnes was born in Philadelphia on April 9, 1834 and died in 1900 residing in Trenton City, New Jersey. According to New York records, they had a son George Shea Dayton on October 1st, 1869 in New York and he died on May 6th , 1939 in Philadelphia. Colonel Dayton was discharged from the 62d , due to wounds, on November 21, 1862, and became Colonel of the 19th Regiment of the Veterans Reserve Corps and transferred to Fort Porter, the headquarters of the 19th VRC at Buffalo, New York. In May, 1865 ,he became President of Court Martial, presiding over the Prisoner of War camp at Elvira, New York ,aka Camp Rathburn, New York. Nicknamed “Hellmira” by its prisoners, 2,963 of 12,123 POW’s assigned there died. He would be assigned to Camp Rathburn until his retirement from service in December, 1865. 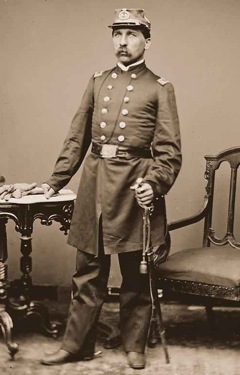 Earlier that year, Oscar V. Dayton was promoted to Brevet Brigadier General on March 13, 1865 for “faithful and meritorious services.”(According to Webster’s 7th Collegiate Dictionary, brevet, by definition, is promoting an officer to a higher rank that what his pay would represent). After the War, General Dayton apparently became involved in several business ventures overseas. On March 6, 1872 he was issued a passport in Duval, Florida. On November 11. 1873, he departed from Cuba, bound for New York in a first class cabin aboard the S.S. Wilmington. His passport stated his occupation as ”Civil Engineer.” The passenger ship S.S. Canima on April 8th, 1879, showed his arrival from Bermuda to New York with an occupation listed as “Army Officer.” The 1880 Federal Census shows Oscar V. Dayton no longer living in New York, but instead residing at 554 Minna Street, San Francisco, California, with his occupation listed as “Capitalist.” He is identified as being married, but no name or initials of his wife was provided. A biography of the general on Wikipedia.com shows that his occupation in the 1880 was that of a commercial agent/broker. General Dayton travelled to England, the birthplace of his grandfather, and according to the 1881 English Census, he was living at Streatham, London. There he became engaged to and married Nicola Frances French ( b. 1845) on January 19, 1891 in Kensington, London. Nicola had been previously married to John Hamilton Venour (b. 1853) and they had a daughter, Helen Anna French Venour (b. 1880). James had died in Capetown, Western Cape, South Africa in 1888. Frances’ father, had emigrated to Australia around 1839, where she was born on July 19, 1845 in Hamilton, Victoria, Australia. Frances’ father, Acheson Jeremy Sidney French and mother Anne Clark Wilson of Monivea, Castle Galway, Ireland returned to Great Britain after a few years. Oscar Dayton as well as Frances’ father were listed as Peers of England. Oscar and Francis had one child, Fanny Dayton, but further information could not be found because the browser was blocked due to non-membership. The marriage bands for Oscar and Frances were announced on the London and Surrey, England Banns and Allegations dated January 19, 1891 that;“a marriage has been arranged and will shortly take place between General Oscar V. Dayton, New York, currently residing at Nice, and Frances N., widow of the late J. Hamilton Venour.” However, at the same time that the bans were announced in England, an announcement occurred within a newspaper in Nice, France that an Oscar Veniah Dayton married Nellie Sexton. No exact date or details were provided except that Nellie died shortly after the marriage. On October 30, 1898, Brevet Brigadier General Oscar V. Dayton died and was buried at Sainte Marguerite Cemetery. The cause of death was also unattainable due to the browser being blocked by non-membership. The Cemetery was originally established by the Anglican Church in 1867 and used primarily by British, American, Australian, Canadian and Irish families until the start of World War I. The Probate Calendar shows that the General left his wife only 152 pounds. Frances, returned to her father’s castle in Ireland where she remained until her death on January 27, 1936. No record of divorce could be found regarding his first wife Agnes Ada Shea who did not die until 1900. Originally published in "ZOUAVE!" No. 68 - August 2015.